Wolfsburg (14 August 2015). Victorious everywhere except for Germany so far – if Volkswagen get their way, between 20 and 23 August 2015, Sébastien Ogier/Julien Ingrassia (F/F), Jari-Matti Latvala/Miikka Anttila (FIN/FIN) or Andreas Mikkelsen/Ola Fløene (N/N) will close a small but crucial gap in the resumé of the Polo R WRC. The Rally Germany, the ninth event in the FIA World Rally Championship (WRC), is the only rally to date that the 318 hp World Rally Car is yet to win. Even though Volkswagen weren’t exactly blessed with luck at their home event around Trier in 2013 and 2014, retiring early with different drivers in the lead at each of the rallies, the team is taking its usual meticulous and highly motivated approach to the task in hand. However, the business of getting a home win is anything but easy: The Rally Germany is the first real asphalt event of the WRC in 2015, and is regarded as the “beast” that really does cause dramas. Volkswagen will take on the “beast” Rally Germany with the same respect as they have for every WRC event, but by no means with fear. Unlike in the previous years, Volkswagen will not be using newly built chassis for Sébastien Ogier and Jari-Matti Latvala, instead they will be using tried and tested chassis that were in action at the “Monte”, in Mexico, Portugal and Poland. And there is another difference from last year: Jari-Matti Latvala and Miikka Anttila are proven asphalt winners – at the Rally France in 2014 they celebrated the first Finnish success on this surface in 14 years, eleven months and 23 days, and also got the win at the fastest asphalt race of all time. Andreas Mikkelsen/Ola Fløene also took this opportunity to prove that they are absolute all-rounders – coming second, after finishing in this position on ice and snow in Sweden and on gravel at the Rally Poland. To build on these successes at the first pure asphalt event since then, Volkswagen has prepared meticulously for the special conditions at the Rally Germany during testing on Corsica and in Germany, and has devised basic tuning for the second generation Polo R WRC for all three driver pairings. 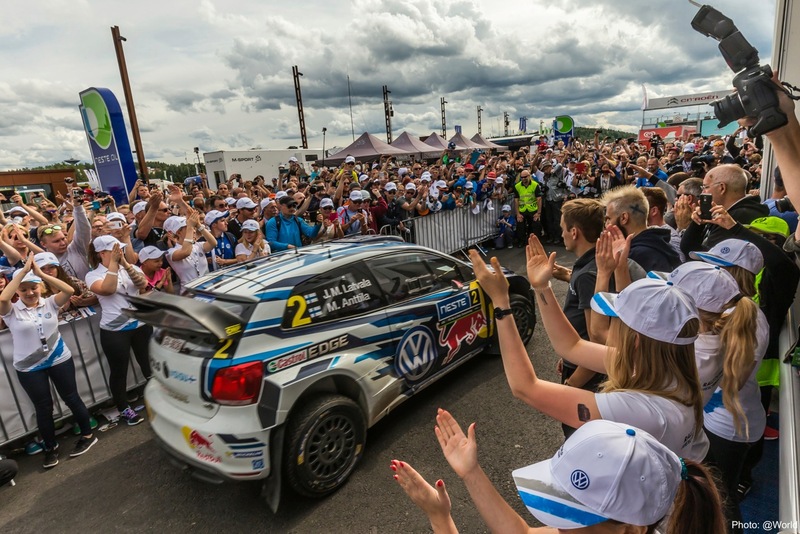 The WRC drivers and co-drivers will be familiar with much of the 2015 edition of the Rally Germany. None of the special stages are completely new to the participants. The notorious Panzerplatte on the military training area of Baumholder – with its unyielding “menhirs” – is on the itinerary four times on Saturday with two different stages. The area, which is only open to civilians during the Rally Germany, has caused all sorts of dramas in the past due to its particularly slippery asphalt combined with those menhirs that are intended to stop tanks. The world’s elite will take on the drift of these special stages with the respect they deserve – at 2.87 and 45.61 kilometres in 2015, they are the longest and the shortest stage of the Rally Germany. However, the highlight is the two special stages on Sunday. “Stein & Wein” and “Drohntal” are characterised by the serpentine road along the vineyards, symbolic of the Rally Germany. The second pass of the Drohntal stage will be the closing “Power Stage” on which bonus points are awarded for the top three driver/co-driver duos. They celebrated Volkswagen’s only podium result in Germany to date: Andreas Mikkelsen and Ola Fløene. 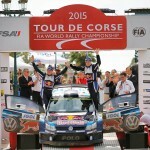 They finished the manufacturer’s home rally in third place in 2014. Six weeks later they proved their pace on this surface again – finishing second at the Rally France, which was still held in Alsace in 2014. Going into his 60th WRC start, Mikkelsen has ten podium results to his name – only one type is still missing: a win. Only a win would see Sébastien Ogier and Julien Ingrassia crowned world champions already at the 2015 Rally Germany. And even then, they would be relying on the help of their direct rivals Jari-Matti Latvala/Miikka Anttila, Mads Østberg/Jonas Andersson (N/S, Citroën), Andreas Mikkelsen/Ola Fløene and Thierry Neuville/Nicolas Gilsoul (B/B, Hyundai). Ogier/Ingrassia would need to extend their current lead of 89 points by 23 to make it 112. 25 points are awarded for a win, with a further three for winning the Power Stage. On a make-up tour of his own: Jari-Matti Latvala and Miikka Anttila want to make peace with the rally around Trier in Germany. In 2014 they drove in a league of their own on “Planet JML” and had built up a lead of more than a minute before they came off the track on the final day and were forced to put the dream of their first win on asphalt to bed. This came soon afterwards in France. If Latvala/Anttila were to finish higher than seventh, the early championship victory of Ogier/Ingrassia would be deferred. … local heroes Erwin Weber and Matthias Berg won the first Rally Germany in 1982? Weber, who was active for Volkswagen from 1987 until 1990, won in an Opel Ascona 400. … a German car manufacturer has never won the Rally Germany since it has been on the WRC calendar? With the exception of 2009, when the race around Trier was not part of the WRC calendar, eleven wins have gone to Citroën and one to Hyundai. 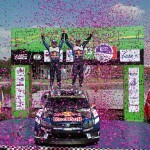 … Volkswagen duo Sébastien Ogier/Julien Ingrassia won the Rally Germany in 2011? The two Frenchmen were victorious at the wheel of a Citroën. … Record world champion Sébastien Loeb is also the record winner in Germany? The Frenchman won a total of nine times, and even eight times in a row from 2002 to 2010. … as well as the WRC class and the supporting championships WRC2 and WRC3, participants of the RGT Cup introduced in 2015 will line up this year? … Volkswagen test and development driver Dieter Depping won the Rally Germany a total of three times (1994, 1996 and 1997)? Until the winning streak of Frenchman Sébastien Loeb, the German held the record for the most victories. … the show start and the prize-giving ceremony at the Rally Germany have only not been held in front of the impressive backdrop of the UNESCO World Heritage Site of Porta Nigra once since it has been part of the WRC calendar? At Volkswagen’s first WRC home event in 2013, it was “Viva Colonia” – the drivers, co-drivers and World Rally Cars were presented on the southern side of the cathedral square in Cologne, “Roncalliplatz”. Crew chief Ralf Arneke has a double celebration at the Rally Germany. In WRC action for the 50th time since Volkswagen started the Polo R WRC project, he will also be celebrating his 50th birthday on rally Saturday. And what is top of his birthday wish-list? See above.